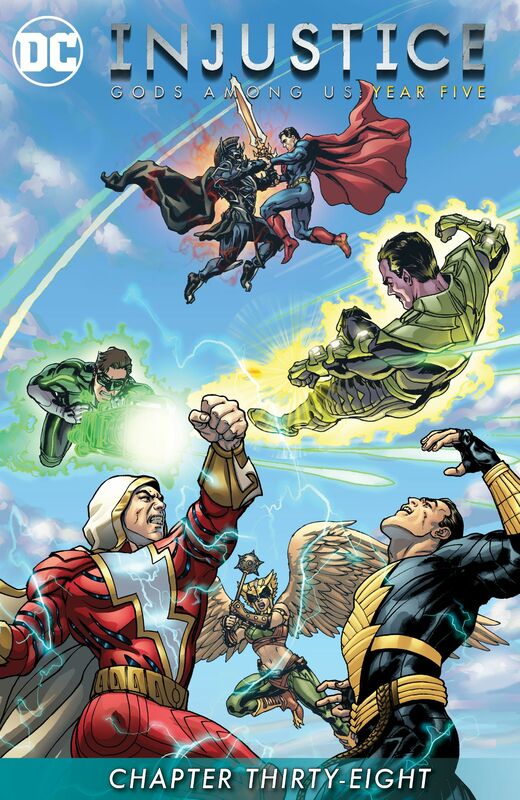 The Justice League contends with a mass amount of villains, and a nuclear threat posed by the Joker... then everyone disappears into a portal that manifests suddenly. Story - 1: What an unmitigated rip-off. Is this even the last installment? The actions of this issue are in line with the cut-scenes of the Injustice video game, making it a twice-told tale, but with no effect past WTH? I've noted Buccellato's contemptuous writing style for his audience, but what did they do to deserve this? Can anyone definitively say what's occurred here? For the record, what was a horrible concept was stabled by Regime Superman becoming an excellent villain, only to have him be lessened by a writer that didn't care about his development or anything else... except cashing in and getting out. Art - 4: There are some beautiful pieces here, and it's all such a waste, which has been the story for Injustice more times than one can count. Again, if this is the end, what a disservice to all involved. Cover Art - 4: Straight coolness!